Everybody gets those days when happiness is not achievable without some fried chicken, and I wanted something horribly unhealthy to accompany it. Remembering fried chickens past, especially the ones I ate about a year ago at Lolo’s, a soul food restaurant in Phoenix, I decided that something with a sweet/savoury finish and a bit of spicing that would stand up to being drizzled with my own approximation of Lolo’s hot sauce was just what the chicken breasts I was cooking needed. The resulting fritters are crisp and puffy, and fall somewhere between an Indian pakora, a Thai fritter and a New Orleans beignet. These are not not awfully good for you. Don’t make them too often. Beat the egg into the milk. 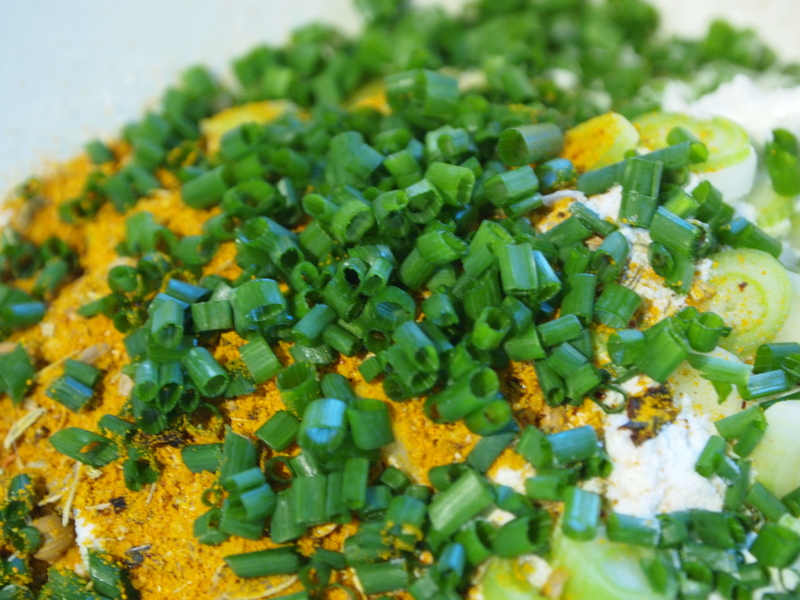 Grind the spices in a mortar and pestle with the salt, and mix with the flour, baking powder, chives and finely chopped spring onions in a large bowl. Use a whisk to beat the egg and milk into the flour mixture until you have a batter. Use a spoon to stir the corn kernels through the batter. Drop heaped tablespoons of the batter mixture into your deep fryer, and cook a couple of minutes on each side, until crisp and golden. 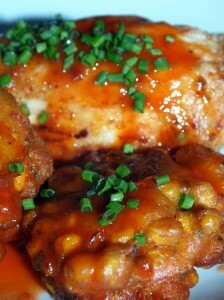 To make the sauce, just combine the honey and hot sauce in a small pan and bring to a simmer, stirring well as you go. Cool before slathering generously all over your chicken and fritters. You can rebottle any extra. It’s my firm belief that every culture in the world has at least one dish which looks like something the cat dragged in, ate, digested, and left as a gift on the hall carpet twelve hours later. Beef rendang is Malaysia’s offering to this noble pool. I’ve not come across a dish like rendang anywhere else in the world. Beef is simmered in a thick mixture of spices, browned coconut and coconut milk until nearly dry, soaking up huge amounts of flavour during the simmering process; the cooking method turns from simmering to frying as the mixture reduces and the oils from the coconut leach out. You end up with a thick, rich, dark brown sauce, packed with herbs and sweetness from shallots and roasted coconut. It’s a dish that takes a while to prepare, so make plenty and freeze what you don’t eat immediately. 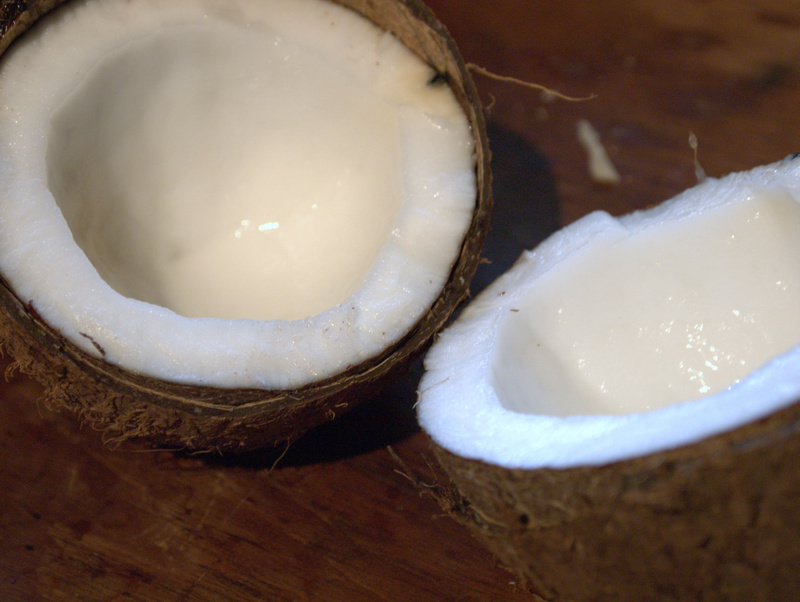 You’ll need to tackle a raw coconut for this recipe. Opening coconuts doesn’t have to be anything like the palaver we seem to make of it in the UK – all that business with towels and hammers. As you can see from the picture, my coconut was bisected neatly. All you need to do to achieve the same thing from yours is to hold it over a bowl, and, using a meat cleaver or large knife (cleavers are available very cheaply at Chinese supermarkets, if you have one in the neighbourhood), tap hard with the blunt edge along the equator of the coconut – the pointy tuft at one end and the three “eyes” at the other are your north and south poles. Keep tapping with the blunt side, not the blade, as hard as you can, turning the coconut as you go, and once you’ve circled it about five times (by which point you will be sweating and swearing that all this work hasn’t made a blind bit of difference) the coconut will split neatly in half, the juice inside falling into your cleverly pre-positioned bowl. It’s magic. Give it a shot. A word on that coconut juice. It’s not the same thing as coconut milk (the stuff you find in a can), which is the grated white flesh of the coconut, moistened and squeezed. Coconut juice is very pleasant on a beach somewhere when your coconut is green and straight off a tree, a nice man has sliced the top off it with a machete, and you have a few shots of rum and a straw; but once your coconut has turned brown and been shipped to the UK, it will be bitter and horrid. Drink it if you must. If you’re smart, you’ll pour it down the sink. Coconut milk is a different matter. For this recipe, it’s more important than ever that you buy some without emulsifiers – you’ll be using the thick, creamy part of the milk separately from the more watery part. I always buy cans of Chaokoh, a Thai brand. If you’ve difficulty tracking it down locally, you can find it (and a paradise of other Chinese, Malaysian, Korean and Japanese ingredients) at Wai Yee Hong, an oriental supermarket in Bristol with an internet shopping arm – I order from them every couple of months, and they’re super-reliable. Open the coconut according to the instructions above. Pry the white flesh away from the shell, and use a sharp knife or a vegetable peeler to remove the brown skin from the flesh. Grate the white flesh and dry-fry, stirring regularly, until dry and dark brown but not burned. While the coconut is frying, soak the tamarind in enough boiling water to cover, poking with a fork until the tamarind is soft. Pick out the seeds. Cut the beef into pieces and marinade in all but 2 tablespoons of the toasted coconut, the tamarind and its liquid, two teaspoons of sugar and a teaspoon of salt. Set aside while you prepare the other ingredients. Put the remaining toasted coconut in the bowl of the food processor with the almonds, turmeric, lime leaves, lemongrass, galangal, ginger, peeled shallots, chillies and garlic. Whizz until everything is reduced to a fine paste. Put the paste in a thick-bottomed saucepan with the runny, milky part of the coconut milk, 100ml boiling water, the palm sugar, another teaspoon of salt, a generous grating of pepper and the dark soy sauce. Stir well and bring to the boil over a moderate heat. Add the meat with any juices, and bring back to a simmer. Continue to cook, without a lid, for an hour, stirring frequently to prevent burning. Most of the liquid will have reduced away by this point. After an hour, add the creamy part of the coconut milk to the mixture and stir well. Add a lid and continue to cook over a reduced heat for another hour, stirring occasionally. 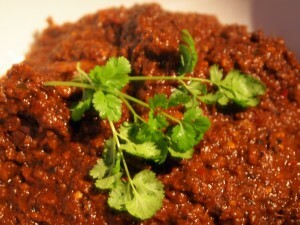 The finished rendang should have a thick, dense sauce, and look oily, the fat having come out of the coconut, almonds and coconut milk to fry off the other ingredients. With what, you say? Bak kut teh. It’s a Hokkien Chinese term which translates roughly as “meaty bone tea”, and it denotes a particular herbal, scenty soup spicing which is traditionally meant to warm you from within. It’s got yang, this stuff. So much so that my mother and brother won’t eat it, because it makes them turn bright red and start sweating. In a period when my village is only accessible over a hump-backed bridge coated with half a foot of sheet ice (it’s been like this since before Christmas), red and sweating is exactly what I’m after. Hurrah for yang. You’ll find bak kut teh served regularly in Malaysia and southern China. Bak kut teh mixtures are available in the UK in oriental supermarkets, in sealed packs containing a couple of tea-bag style sachets. These sachets are preferable to the whole spices, which you also see sometimes in neat plastic packs – the whole spices can make your recipe a bit gritty. If you’re making the traditional stew, just pop a bag in a crockpot with some rib bones, simmer for a few hours, and serve with rice or as a noodle soup with a generous slosh of soya sauce. It’s hearty stuff – the traditional mixture includes star anise, angelica, cinnamon and cloves. This mixture is, somewhat eccentrically, close to what you’ll find in a British Christmas cake. The recipe below is not a traditional use of a bak kut teh sachet, but it’s none the worse for that. Here, you’ll be combining those spices with rice wine, several gloppy Chinese sauces, honey, spring onions and garlic, and using this stock to perfume a slab of pork belly. The belly meat is pressed under weights overnight in the fridge, then chopped and fried in a wok until it’s crispy. I know, I know: but the long simmering will render a lot of the grease out of the meat, and sometimes the weather just calls out for fatsome, sticky pork. I served mine with some sticky hoi sin sauce to dip, alongside a little of the stock, thickened with cornflour, to moisten the rice we ate with it. Hang onto the stock – you can freeze it and treat it as a master stock. I poached a couple of hams in mine, leaving them spiced and savoury but not overtly Chinese-tasting; it’s back in the freezer now, and I have plans to poach a chicken in it next. This procedure may sound overly parsimonious to those used to stock cubes, but it’s a method that produces a stock with an incredible depth of flavour, and you can keep using it indefinitely as a poaching liquid, adding a bit more water or wine and some more aromatics every time you cook, and making sure that every time it comes out of the freezer the stock gets boiled very thoroughly. There are restaurants in Hong Kong which claim that their master stock has been on the go for more than a hundred years. Stir the liquid ingredients together in a saucepan that fits the pork reasonably closely, and slide the pork in with the star anise, garlic and spring onions. Bring to a gentle simmer, skim off any froth that rises to the surface with a slotted spoon, cover and continue to simmer gently for two hours. Remove the pork from the cooking liquid carefully and place it on a large flat dish with high enough sides to catch any liquid that comes out of the meat as you press it. Strain the poaching liquid if you plan on using it as a master stock. Place a plate or pan lid large enough to cover the whole belly on top of the meat (the skin side) and weigh it down. I used a heavy cast-iron pan lid and all the weights from my kitchen scales. Cover the whole assembly with a teatowel and leave it in the fridge for 24 hours. When you are ready to eat, remove the pressed meat to a chopping board and use a sharp knife to cut it into bite-sized pieces, about 2cm square. Bring about 5cm depth of groundnut oil to a high temperature in a wok, and fry the pieces of pork in batches of five or six pieces until golden (this should only take a couple of minutes per batch). 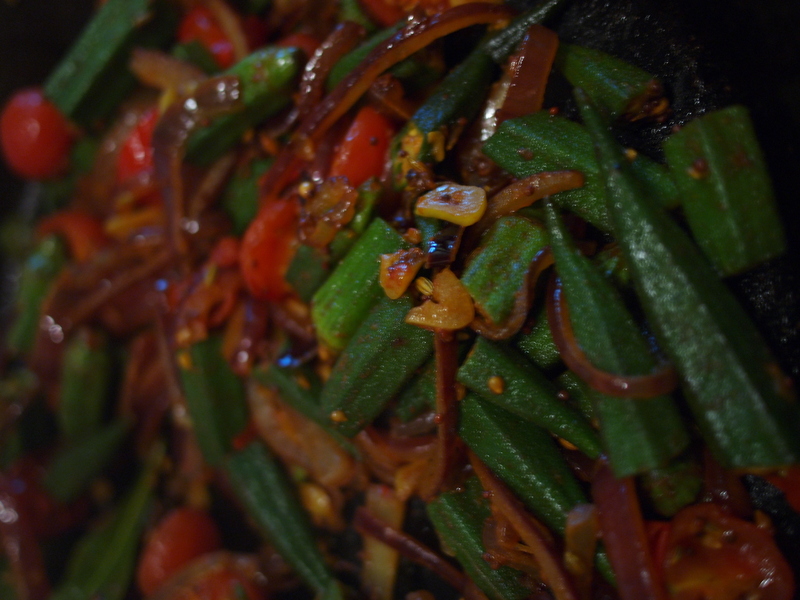 Serve with shredded spring onion and some hoi sin sauce with steamed rice and a vegetable. I seem to get through an awful lot of bell peppers at this time of year, when sunshine is a dim and distant memory. This dish is a rich and glossy version of the traditional Poulet Basquaise, where the sweetness of the peppers works deliciously against tiny pieces of salt pork and the savoury chicken. I got hold of a strip of salt pork from the Polish deli in Newmarket. (Just off Fred Archer Way, by the short-stay carpark on Wellington St.) A lot of towns, especially here in East Anglia, now have Polish stores selling some really fantastic preserved meats like smoked sausages and fat salt pork. I’ve also been using our local one to stock up on soused herrings, some great pickles and the holy grail – cartons of cherry juice. If you have a Polish shop near you, go in at the weekend and have a rummage; you’ll find some really interesting ingredients and, if you’re lucky, will discover a new addiction to that cherry juice. Slice the peppers into strips, and put them aside in a bowl. Put the diced shallot and onion and diced celery in another bowl with the crushed garlic. Rub the chicken breasts with the sugar, salt and pepper. Cut the salt pork into small dice (about half a centimetre) and put in a large, heavy-based casserole dish. Cook over a low to medium heat, stirring occasionally, until all the fat has rendered out and the dice of pork are tiny and golden. Turn the heat up to medium-high and brown the whole chicken breasts on all sides in the fat. When they are golden all over, remove them to a plate with a slotted spoon. Turn the heat back down to medium-low. 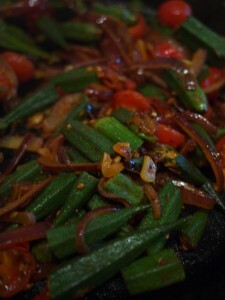 Add the paprika, bay leaves, crushed chillies and fennel seeds to the pan with the shallots, onion, celery and garlic. Sauté in the remaining fat (adding a little olive oil if you think it’s necessary) for about five minutes, until the vegetables are soft. Add the peppers to the pan and cook for another five minutes, keeping everything on the move, then return the chicken to the pan along with any juices, stirring well so the paprika mixture coats everything. Add the wine to the dish, and let it bubble up to a simmer. Pour in the stock and passata and stir a tablespoon of concentrated tomato purée through the mixture. Put the lid on and simmer for 30-40 minutes. Stir through the crème fraîche just before serving, and garnish with parsley. I served this with sautéed potatoes. It’s also great with buttered rice and a salad. This red-cooked Mexican pork is marinated in an acidic dressing, then cooked slowly for hours, with meltingly tender results. It’s a traditional recipe from Yucatan, where pork would be marinaded in the bitter local orange juice with achiote paste, then wrapped in banana leaves and buried in a fire pit for hours (pibil is Mayan for buried). Those of you without a handy banana tree and fire pit can make it in the oven in a dish sealed tightly with tinfoil – banana leaves, although very decorative, don’t really add any flavour, so you’re not really losing out here. The juice of bitter oranges can be approximated with a bit of vinegar and some lemon juice blended with sweet orange juice. Unfortunately, while you can do clever conjuring tricks with your lemons, vinegar and tinfoil, there’s not really anything you can substitute for the achiote paste in this recipe. Achiote is what gives this dish its lovely red colour. It’s a made from crushed annatto seeds – in the UK you can sometimes find achiote powder (Barts make it and it’s stocked in the spices section in some supermarkets), but the paste is far preferable. The Cool Chile Company, Mexgrocer and Casa Mexico are good UK suppliers of Mexican ingredients, and will mail you some paste. Start by chopping the pork into chunks about 3 inches square. Don’t trim the fat away – it will moisten the meat as it cooks. Put the pork in a large bowl with the herbs, spices, juices, vinegar, salt and garlic, stir well to blend all the ingredients and marinate overnight. When you come to cook the pork, chop the onion into large chunks and brown the chunks in a dry frying pan. Chop the peppers into long strips. Spread the pork and its marinade evenly in a shallow dish, layer the onion and peppers on top, and cover tightly with a couple of pieces of tinfoil, making sure you make a good seal all around the edge of the dish. Roast on a low rack in the oven at 150°C (300°F) for three hours. When the cooking time is up, unwrap the dish and leave to rest for ten minutes. Serve on tortillas (corn tortillas are great if you can find them – again, they’re sometimes hard to find in the UK) with guacamole, a good dollop of sour cream or crème fraîche (crème fraîche is closer to the crema you’d eat in Mexico), some fresh coriander and Mexican pickled onions. Those onions are the gorgeous pink things in the picture at the top, and they’re a traditional accompaniment for this dish – I’ll put up a recipe for them later in the week.